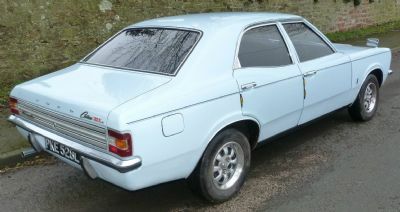 Model: Mk3 Cortina OHV 8v 1598cc. Type: 4-Cylinder 4 Door Saloon Automatic. Notes: Was For Sale showing 55000 + Miles (NOT BY ME) in Thornton-Cleveleys, Lancashire on E-Bay for £4.750 (September 2010). Relisted (NOT BY ME) in Poulton-le-Fylde, Lancashire showing 67000 + Miles for £5.295 (March 2015). DVLA Records show First Registered 01 August 1972 and it had not been Taxed since 11 April 2015, now Taxed until 01 May 2020. MOT Expired: 24 April 2016, now MOT Expires: 24 April 2019. According to www.newreg.co.uk This registration was issued, but they dont have an accurate issue date. The original office for this letter combination is Kent C.C.